There are so many Old Wives' Tales that we grew up with. An Old Wives' Tale is by definition, "an oral superstition, belief, or story that has been passed down through generations". They were supposed to be traditional wisdom, but in reality were more like folklore. Depending on your culture, your parents or grandparents imparted their wisdom, and you internalized it, and often grew up repeating the same superstitions to your children, and grandchildren. Some of these are a lot of fun today, after technology and improved medical care has shown that most of the Old Wives' Tales we learned as kids have no factual basis of truth. Living in an Eastern European country, Romania, I was fascinated and frustrated with some of the Old Wives' Tales, or superstitions, that were so prominent in everyday living. I quickly learned that there was an Old Wives' Tale for just about everything, or superstitions that were ingrained in their culture. I started a list of these Old Wives' Tales and superstitions, and no matter how many I had, there just seemed to be more. Sometimes I thought I was living like the Wilders in the old Little House on the Prairie TV series, before medicine and technology played a big role in dispelling these tales. The most frustrating one to me was the one about the curant (draft). Both young and old believed that you would get sick if you were in a draft. I traveled a lot by train, and all except for the most expensive Intercity trains were without any type of air-conditioning. It would get sweltering hot in the summer with about 8 people stuffed in a small compartment, and no air. It was unforeseeable to open the window or you would hear," the curant, the curant"! I swear I learned to really dislike that word! 3) If you sit at the corner of the table you will never get married. 4) If a spider falls on your face or clothes, you will receive money. 5) A Pregnant woman should not touch animals and should not steal or her child will have a birthmark. 7) If you see a priest while walking its bad luck (unless your grab a button). Many of the Romania Old Wives' Tales center around their religious beliefs, and in the country they are even more superstitious than some of the people in the cities. It was quite an experience trying not to laugh at some of the things I heard, but also frustrating with others. As a child growing up in America, a couple of the Old Wives' Tales were ones we were taught, while others I have no idea where I heard them. One of the most popular ones I remember was, "If you step on a crack, you'll break your mothers back!" This one made a good game while walking as we tried to avoid all the cracks in the sidewalks. Here are a few more Old Wives' Tales I remember, although at the time I believed them. 1) If you break a mirror, you will have 7 years of bad luck. 2) If a black cat crosses your path you will have bad luck. 3) A variation of the Eastern European Baba (witch) was our Boogy Man...."If you're not good, the Boogy Man will get you!" 5) If you see a shooting star it will bring good luck. Thinking of these Old Wives' Tales was a lot of fun, but so much more fun when another friend, Sylvestermouse started telling me the ones she remembered hearing. While we were doing them online, her husband and mother joined in the fun. These are the ones they were remembering, mostly from their Southern Grandmothers. So, thank you Sylvestermouse and family for a fun evening. I left the editorials exactly as she wrote them. 2. dropping sissors, your spouse is having an affair. 5. Walking under a ladder will cause bad luck. 6. If a black cat crosses your path you will have bad luck. 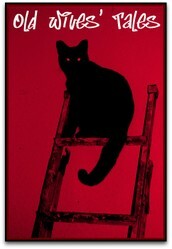 (Personally, I hug black cats and walk under ladders just to challenge that myth). Yes, as you can see remembering these Old Wive's Tales can be a lot of fun. Thank you Sylvestermouse, and family for a wonderfully fun evening! How many of these Old Wives Tales did you remember? Any you want share? I remember a lady showing me a birthmark on her arm and explaining it had been a 'mouse'. Apparently her mother had been startled by a mouse during her pregnancy. I remember most of the wive's tales from the US. Another my grandmother swore by was left palm itches: money going out -- right palm itches: you will get money. I can see how you were entertained in Romania with some of their superstitions! LOL, Kathy! We all had so much fun with these. I am so glad we just happened upon you that night. We had a lot of fun remembering those old sayings and thinking about the wonderful women who shared them with us originally. Reading them again makes me giggle even now. I didn't hear the ones you already had compiled. I find it most interesting now to read the one about the spider being a sign of receiving money, because, you may recall, that was the very night I had just started planning my pom pom spider article. Now that is rich! Isn't wonderful to have these old wives tales to entertain us! These are entertaining, and yes I welcome black cats crossing my path too. I think here on the other side of the pond we share several of these and maybe sent them your way to begin with or adopted others from you, but another one I can think of is shoes on the table being bad luck. And don't put an umbrella up indoors. We also have the money spider thing here too, and a bird pooping on you is supposed to bring good luck though somehow I fail to see how!